Min. Fin., Dep. of Expt. Though the Judgement is based on my Personal Writ Petition, hope DOPT will apply it to all covered under its jurisdiction. 3. 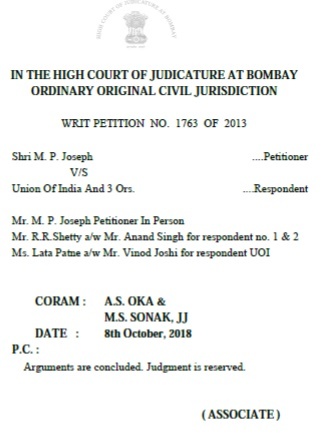 The challenge in this petition to the judgment and order dated 16th April, 2013 made by the Central Administrative Tribunal (for short 'the CAT'), dismissing the Original Application No. 145 of 2013 instituted by the petitioner seeking benefit of Modified Assured Career Progression (MACP) with effect from 1st January, 2006 along with all other consequential benefits. 4. 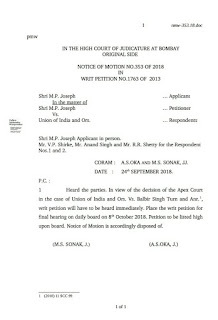 Mr. M. P. Joseph-the petitioner in person submits that the issue raised in the present petition is answered in favour of the petitioner by the Hon'ble Apex Court in the case of Union of India and others Vs. Balbir Singh Turn and another (2018) 11 SCC 99 and therefore the CAT's impugned judgment and order may be set aside and the relief prayed for by him in his Original Application No. 145 of 2013 be granted. 5. The learned Counsel for the respondents submit that the benefit under the MACP cannot be regarded as any part of the pay structure extended to the civilian employees and therefore the CAT was justified in denying relief to the petitioner. The learned Counsel submit that the recommendations of the pay commissions are not per-se binding upon the Government and the implementation, including the date from which such recommendations are to be implemented are matters in the discretion of the Government. Since, in the present case, implementation in respect of allowances was directed with effect from 1st September, 2008, the petitioner was not at all justified in seeking implementation with effect from 1st January, 2006. For these reasons the learned Counsel for the respondents submit that this petition may be dismissed. 6. The rival contentions now fall for our determination. 7. There is no dispute in the present case that the petitioner is eligible for receipt of benefits under the MACP. The only dispute is whether the petitioner is required to be granted the benefits under the MACP with effect from 1st January, 2006 as claimed by him in his Original Application No. 145 of 2013 or whether such benefits are due and payable to the petitioner with effect from 1st September, 2008 as contended by and on behalf of the respondents. 9. As noted earlier, the only issue which arises in the present petition is whether the benefit under MACP is to be regarded as a part of the pay structure of pay bands and grade pay or whether such benefit is to be regarded as “allowances (except dearness allowance/relief)”. If the benefit under MACP is to be regarded as a part of the pay structure of pay bands and grade pay, then obviously the petitioner is right in contending that such benefit will have to be extended to him with effect from 1st January, 2006 in terms of Clause (i) of the aforesaid resolution dated 30th August, 2008. However, if, as held by the CAT in the present case, the benefit of MACP is to be regarded as “allowances (except dearness allowance/relief)”, then the respondents would be right in their contention that such benefit is payable only with effect from 1st September, 2008. 10. The aforesaid was the precise issue which arose for consideration in case of Balbir Singh Turn (supra). The Apex Court upon consideration of the Central Government Resolution dated 30th August, 2008 along with Part-A of Annexure-I thereto has clearly held that the benefit under MACP is a part of the pay structure and therefore such benefit was payable from 1st January, 2006 and not from 1st September, 2008. “6. The answer to this question will lie in the interpretation given to the Government Resolution, relevant portion of which has been quotedhereinabove. A bare perusal of Clause (i) of the Resolution clearly indicates that the Central Government decided to implement the revised pay structure of pay bands and grade pay, as well as pension with effect from 1-1-2006. The second part of the clause lays down that all allowances except the dearness allowance/relief will be effective from 1-9-2008. The AFT held, and in our opinion rightly so, that the benefit of MACP is part of the pay structure and will affect the grade pay of the employees and, therefore, it cannot be said that it is a part of allowances. The benefit of MACP if given to the respondents would affect their pension also. Three ACP upgradations after 8, 16 and 24 years of service has been approved. The upgradation will take place only in the hierarchy of grade pays, which need not necessarily be the hierarchy in that particular cadre. Part B of Annexure I deals with allowances, concessions and benefits and conditions of service of defence forces personnel. It is apparent that the Government itself by placing MACP in Part A of Annexure I was considering it to be the part of the pay structure. 12. The CAT, when it delivered the impugned judgment and order dated 16th April, 2013 did not have the benefit of the ruling of the Apex Court in Balbir Singh Turn(supra) which was decided only on 8th December, 2017. The view taken by the CAT in the impugned judgment and order is now in direct conflict with the view taken by the Apex Court in Balbir Singh Turn (supra). Obviously, therefore, the impugned judgment and order will have to be set aside and the petitioner will have to be held to be entitled to receive the benefits under MACP with effect from 1st January, 2006 together with all consequential benefits. 13. The contentions raised by and on behalf of the respondents cannot be accepted, particularly, in the light of the ruling of the Apex Court in Balbir Singh Turn (supra). The Apex Court, in clear terms and in the precise context of Central Government's resolution dated 30th August, 2008 held that the benefit of MACP is a part of the pay structure and not merely some allowance. The Apex Court has held that the benefit of MACP affects not only the pay but also the pension of an employee and therefore, the same, is not an allowance but part of the pay itself. In terms of Clause (i) of the Central Government's resolution, admittedly, the pay component became payable with effect from 1st January, 2006 unlike the allowance component which became payable from 1st September, 2008. 14. Besides, this is not a case where the petitioner was insisting upon preponement of the date for implementation of the recommendations of the pay commission. The Central Government, vide resolution dated 30th August, 2008 had already accepted the recommendations with regard to POBR, no doubt subject to certain modifications. The relief claimed by the petitioner was entirely consistent with Clause (i) of the resolution dated 30th August, 2008, which in fact required the Government to extend benefits of revised pay structure of pay bands and grade pay, as well as pension with effect from 1st January, 2006. (a) The impugned judgment and order dated 16th April, 2013 made by the CAT is hereby set aside. (b) The petitioner is held entitled to receive the benefit of MACP with effect from 1st January, 2006 together with all consequential benefits. (c) The respondents are directed to work out the benefits of MACP with effect from 1st January, 2006 together with consequential benefits and to pay the same to the petitioner as expeditiously as possible and in any case within a period of three months from today. (d) If, such benefits/consequential benefits are not paid to the petitioner within three months from today, then the respondents will liable to pay interest thereon @ 6% p.a. from the date such payments became due and payable, till the date of actual payment. (e) Rule is made absolute in the aforesaid terms. There shall however be no order as to costs. I have filed the present Writ Petition on 05/07/2013 with the main relief of setting aside of the Judgement and Order NO. O.A.145 of 2013 dated 16/04/2013 of the Learned Central Administrative Tribunal, (CAT) Mumbai Bench at Mumbai, as it is not based on facts and law. It was admitted on 09-07-2014, and since then it is kept under ‘Unready” without any further date. a). Expunge and or nullify Para 9 of the Office Memorandum no.35034/3/2008- Estt. (D) dated 19/05/2009 issued by DOPT and declare the effective date of MACPS as 01/01/2006 as fixed by the Government Resolution mentioned herein above and various other legal provisions mentioned in para 6 (i) to (vii). c). Being a common issue, direct the 1st Respondent to issue necessary order intimating the order to various Ministries and to act upon it. “16. We have already said that the MACP Scheme is not a part of pay but the same is definitely a financial benefit extended to the civilian employees of the Government of India. 4. I further state that, the Supreme Court took an opposite view that the MACP Scheme is a part and parcel of the Pay in a recent appeal case filed by the Union of India against the decision of the Armed Forces Tribunal (AFT), [(2018) 11 SCC 99 Union Of India vs Balbir Singh Turn & Another], where also similar MACP Scheme is prevailing. The Court said (para 10), “We are only concerned with the interpretation of the Resolution of the Government which clearly states that the recommendations of 6th CPC as modified and accepted by the Central Government in so far as they relate to pay structure, pay scales, grade pay etc. will apply from 01.01.2006. There may be some gainers and some losers but the intention of the Government was clear that this Scheme which is part of the pay structure would apply from 01.01.2006. We may also point out that the Resolution dated 30.08.2008 whereby the recommendation of the Pay Commission has been accepted with modifications and recommendations with regard to pay structure, pay scales, grade pay etc. have been made applicable from 01.01.2006. This is a decision of the Cabinet. This decision could not have been modified by issuing executive instruction. The letter dated 30.05.2011 flies in the face of the Cabinet decision reflected in the Resolution dated 30.08.2008. Thus, administrative instruction dated 30.05.2011 is totally ultra vires the Resolution of the Government”. 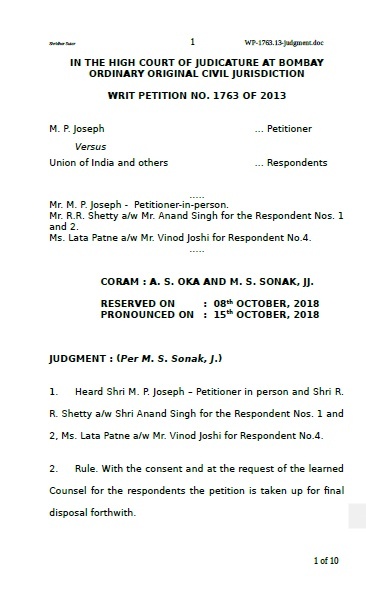 The only difference in this Supreme Court case and that of the Petitioner’s case is that of the date by which the Office Memorandum / Letter issued by D.O.P.T. for civil side and by Defence Ministry for Armed Forces i.e., 19-05-2009 & 30-05-2011 respectively. But in both these cases, modified implementation date of MACPS was the same 01/09/202008. This date was the subject matter under challenge before the CAT and now before this Hon’ble Court in the Writ Petition under consideration. 5. I also state that when the Union of India subsequently filed 2 more appeals on the same issue, the Supreme Court termed those cases as frivolous or infructuous cases and dismissed both of them by imposing heavy cost of Rs.1,00,000/-on the Appellants [Union of India & Ors. V. Pirthwi Singh & Ors. JT 2018 (4) SC 404], thereby fortifying its stand on the issue as decided in the first case that the MACP Scheme is a part and parcel of pay. 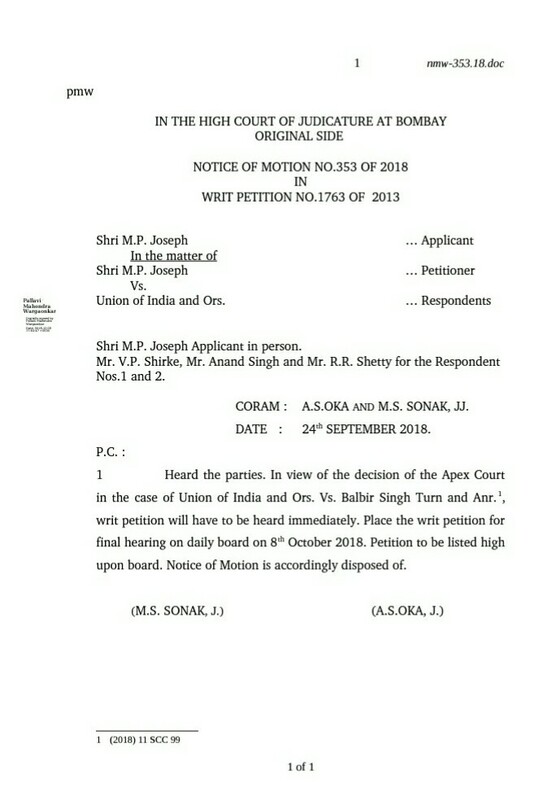 Dear readers, as you are already aware from my earlier blog on the subject, while in service, I had instituted a Writ Petition before the Hon’ble Bombay High Court challenging the decision of Central Administrative Tribunal in respect of the effective date of the MACP Scheme of 6th Pay Commission. Several similar appeal cases against the Armed Forces Tribunal decision were also pending before the Hon’ble Supreme Court in respect of 6th Pay Commission. The issues were the same in both the cases. Now the SC decided the 6th CPC case rejecting the Government Appeal and in favour of the Employees. So the same decision is equally applicable for my case. So I am going to move the Hon’ble Bombay High Court for an expedite hearing of my case after the May vacation. I think even otherwise, Government has to act upon the Supreme Court decision though it was related to the Armed Forces Case. For your information, I am giving below the main points of the Writ Petition filed by me before the Hon'ble Bombay High Court at Mumbai regarding MACP Scheme EFFECTIVE DATE. Below that, I am also giving the decision of the Supreme Court in this regard. “11. We are only concerned with the interpretation of the Resolution of the Government which clearly states that the recommendations of 6th CPC as modified and accepted by the Central Government in so far as they relate to pay structure, pay scales, grade pay etc. will apply from 01.01.2006. There may be some gainers and some losers but the intention of the Government was clear that this Scheme which is part of the pay structure would apply from 01.01.2006. We may also point out that the Resolution dated 30.08.2008 whereby the recommendation of the Pay Commission has been accepted with modifications and recommendations with regard to pay structure, pay scales, grade pay etc. have been made applicable from 01.01.2006. This is a decision of the Cabinet. This decision could not have been modified by issuing executive instruction. The letter dated 30.05.2011 flies in the face of the Cabinet decision reflected in the Resolution dated 30.08.2008. Thus, administrative instruction dated 30.05.2011 is totally ultra vires the Resolution of the Government. 12. Col. R. Balasubramanian, learned counsel for the UOI relied upon the following three judgments viz. P.K. Gopinathan Nair & Ors. v. Union of India and Ors.1, passed by the High Court of Kerala on 22.03.2017, Delhi Urban Shelter Improvement Board v. Shashi Malik & Ors.2, passed by the High Court of Delhi on 01.09.2016, K.K. Anandan & Ors. v. The Principal Accountant General Kerala (Audit) & Ors3 passed by the Central Administrative Tribunal, Ernakulam Bench, Kerala on 08.02.2013. In our view, none of these judgments is applicable because the issue whether the MACP is part of the pay structure or allowances were not considered in any of these cases.